Barefoot In Blue Jeans: St. Honore Boulangerie- Division St.
St. Honore Boulangerie- Division St.
St. Honore Boulangerie is the usual place for my Grandma Biggs and I. 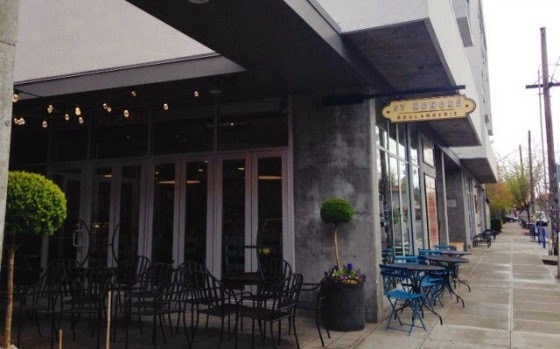 We first started going to the St. Honore in Northwest Portland a few years ago, and we loved it! It is a beautiful, authentic, French cafe and they have the most decadent pastries and breads for purchase. Today, my Grandma Biggs and I ventured to the new St. Honore location on Division Street in Portland, Oregon. The new location on Division street is a little more spacey, but has the same, great, French cuisine. The service at St. Honore is always friendly, no matter what location. They have WiFi you can use, but you should be a customer at St. Honore to use it. They offer a wide selection of delicious pastries, breads, and meals. 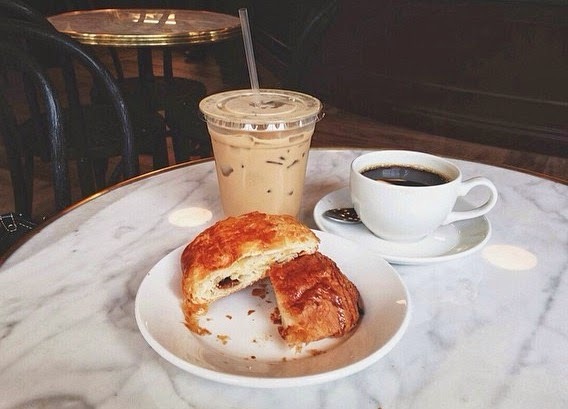 Since it was still early in the day, my Grandma and I decided to grab a little breakfast and coffee at St. Honore. I ordered an iced vanilla latte, and my Grandma ordered just a regular coffee, and we shared a lovely, buttery, flaky, chocolate filled pastry. In French, it is called Pain au Chocolat. 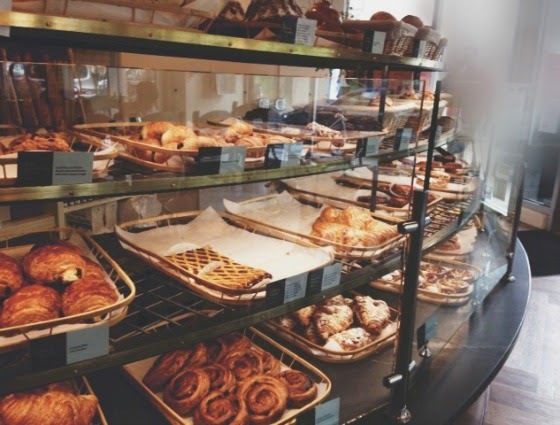 Being that St. Honore Bakery has so many delicious desserts, my Grandma Biggs and I decided that we would take two Saturdays each month, and we would go to St. Honore Bakery, and try them all! We would do one dessert each Saturday that we go, and our goal is to try to them all! We are going to keep a little journal and rate each dessert. I will also keep a record on my blog. This is going to be a delicious project. My Grandma Biggs and I discussed our Pain au Chocolat pastry after we ate, and we decided to give it a 3.5 on a scale of 1-5. This flaky, buttery sweet pastry has a little surprise in the middle, a decadent chocolate filling. The reason why we rated this pastry 3.5 is because we were expecting this pastry to have a little bit more chocolate filling. This pastry is delicious, we just expected a little more chocolate. 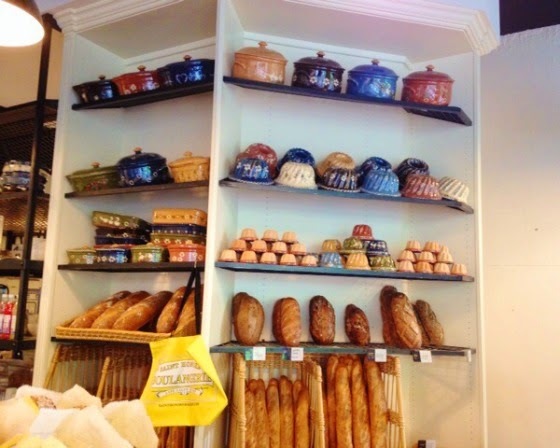 They had these beautiful, hand-painted bake ware stacked on shelves in the wall, those pans are from Alsace, France. The cashier told us that they have a second set of hand-painted bake wares and they use those for dinner time, and serve the meals in those pans. I would love to go there during dinner hours, and be served a lovely, French meal in those beautiful pans. 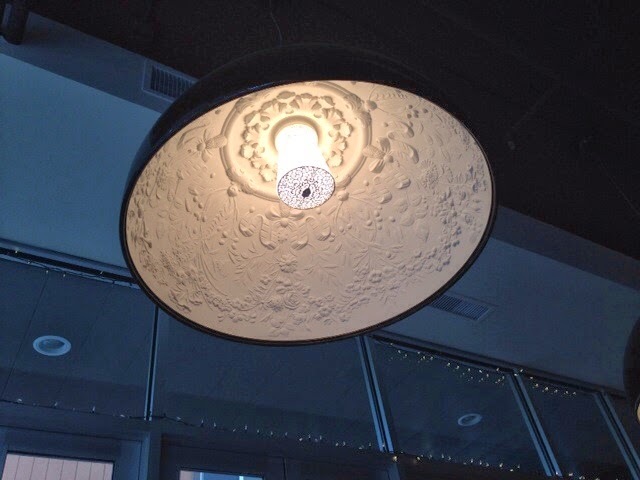 There was this gorgeous light fixture above a neighboring table, inside the fixture were these beautiful designs. The atmosphere in St. Honore is so relaxed. There is a counter in the back and you can watch the bread being made. St. Honore is kid-friendly, there were two children sitting at the counter and they were given little rolling pins and cookie cutters, and some bread dough and they were able to help with the bread making, and practice. 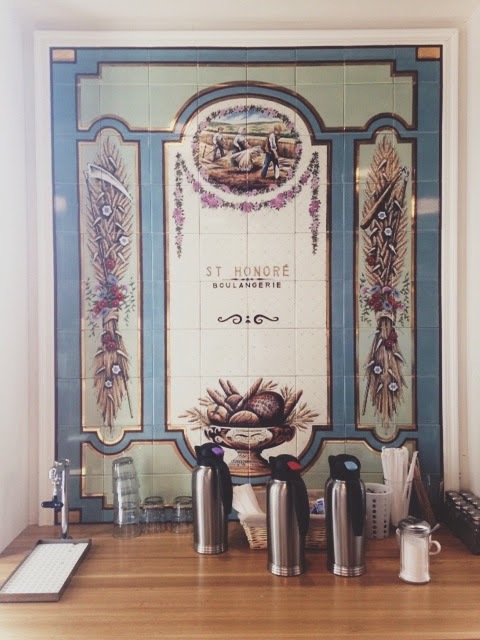 St. Honore Boulangerie is a wonderful cafe, you feel as though you are in France.